What is the green rust? I don't know. No one knows! It's the McGuffin, okay? It's a bad thing that will destroy THE WORLD, and the nasty Dr. Van Heerden is determined to unleash it... just as soon as he marries Oliva Cresswell. But will Oliva chose him or the mysterious Mr. Beale? Questions! 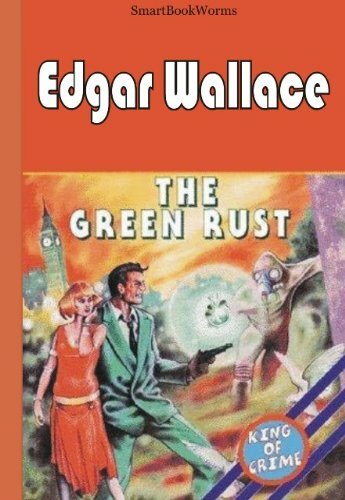 The Green Rust is the first book I've read by Edgar Wallace, who I take it was the James Patterson of his time (wrote tons of books, was worth millions of dollars). It was soooo pulpy, you guys. If Wallace can find a way to go for shock value, even if it makes no sense in the context of the story, he will do it. For example, the first few chapters run like this: Chapter one, an old billionaire struggles to share his final words, but dies just before he can get them out. But does he die? No, he was murrrrderrred! Chapter two: evil dude is evil and like five guys break into Oliva Cresswell's apartment, why? Who knows. But one of them shows her the green rust! "What is the Green Rust—what can it do? she asked in bewilderment. "I hope we shall never know," he said, and in his clear eyes was a hint of terror. Dun dun dun! Chapter three: Oliva goes to work as normal, because that's what you do when your apartment has been broken into multiple times in one night and you've been shown the green rust, whatever it is--and is fired for no reason! Then three people accost her on the street and offer her jobs involving very little work and double her last salary. Wut? And you know how Stephen King once said the road the hell is paved with adverbs? Well, if that's true I think Wallace might at the very least be in purgatory, because The Green Rust is flush with adverbs along the lines of, '"Gross!" Oliva exclaimed disgustedly.' Oh, she's disgusted? Wouldn't have guessed that one just from the dialog, thanks. All that being said, though, I really enjoyed this novel. It's totally cheesy and predictable, but it's also super fun. It has the same sensibility as Scooby Doo or Flash Gordon. Yeah, maybe the writing isn't the best, but the characters are likable: Beale is such an appealing hero, even showing suggestions of being a feminist by referring to Oliva as a partner and saying he never thought of her as a victim. And Van Heerden is so over-the-top evil I couldn't help but warm up to him. Like a German Grumpy Cat (technically he's Dutch, by the way, but hey, close enough). After Oliva escapes Van Heerden, the book became all about Beale finding the green rust and putting a stop to it, or something, and the story slowed down to a crawl because I didn't really care about the green rust. Other than that, though, I thoroughly enjoyed The Green Rust for what it was, which is over-the-top pulpy entertainment. Worth the read if that sort of thing appeals to you, I think.